My observations, values, thinking, feelings & analysis on what is happening in & around - Showcasing my Domain!! Everyday you get up in the morning, you see light and colors around you. You perceive them your way. You head start your day with certain things in your mind, leaving that comfortable and most important place your house i.e. your Bedroom. Bedroom is a place which gives you comfort, solace and calm after a whole day of hush hush. Bedroom needs to be treated well for what it does for you. It needs your love, tender touch and care in the form of colors and lights. 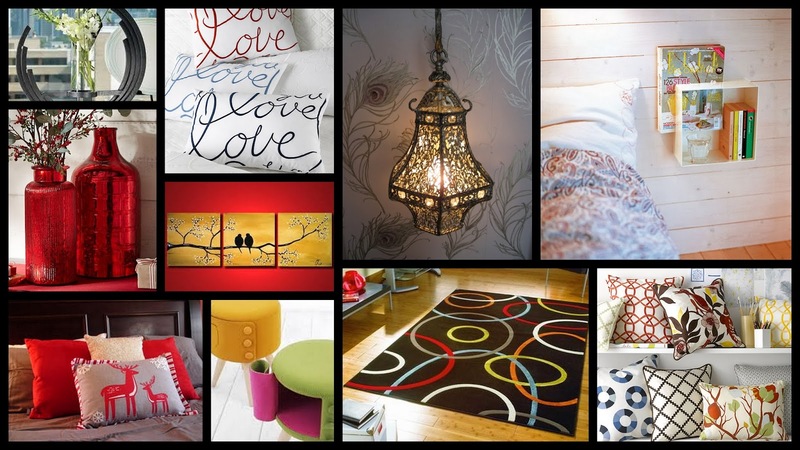 It not only will make your room look appealing but also will have effect on your psyche. The perception, the thoughts and how we react are influenced by the colors around us. Our mood, emotions and even physical feelings have a great deal to do with colors. That is why it is very important how we choose the colors of our bedroom, which mostly depends upon personal choice and then the appeal. Colors can be categorized in to Warm and Cold. 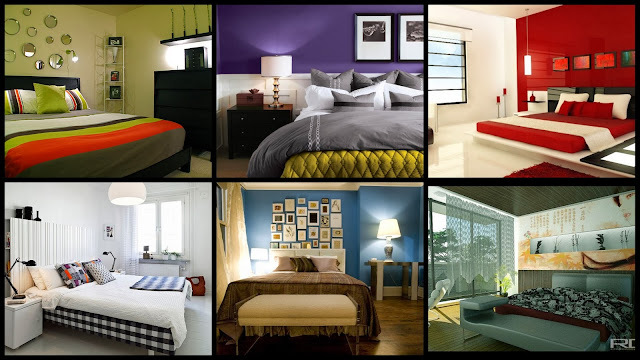 Depending upon personal taste a person can choose the color to paint the bedroom. Also getting the right kind of furniture and accessories plays an important role. Since both things need to compliment each other, else the place may end up looking weird. One need to be cautious. Psyche of person(s), whose bedroom it is. Shades of color - Warm vs Cool - Warm colors are known for stimulation and excitement while cool colors have far more relaxing and chilling effect. Warm colors like red, orange, yellow are known for activity based rooms. Also they make the room look small, while the use of Cool colors like Blue, White, Purple makes the room look large. But you can use combinations, like use of light colors of your choice with pastel color of same shade or any other contrasting color. You can also paint the whole room in one color while painting only one wall in contrasting dark color where you can put photographs of couple if its the room of a couple or children in case of its a child's bedroom. If you choose white color for your bedroom, you can have one wall painted red / maroon with couple's photographs of happy moments or other pictures as per your mood or style with solid color base frames hanging on them. 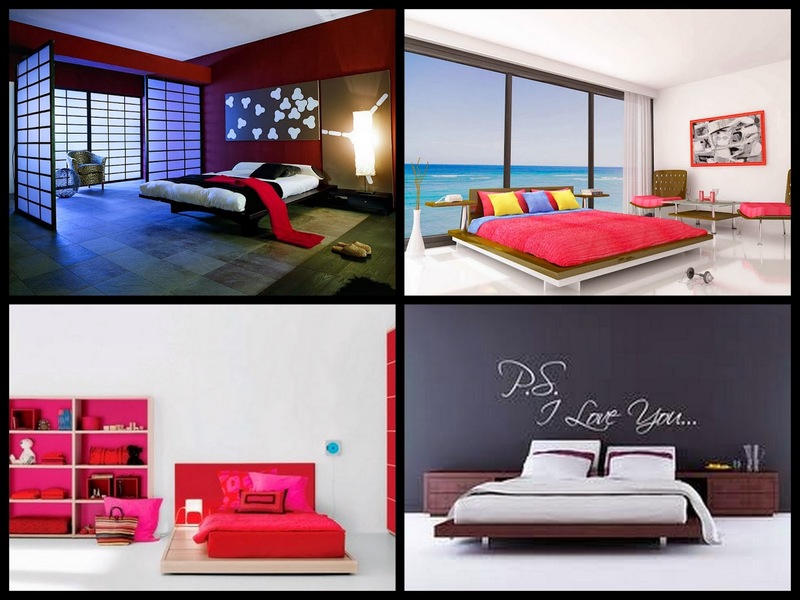 In this kind of color combination you can also go for same shade (red / maroon) bed set and curtains. And yeah tiles also play an important role. If walls are white, tiles better be white or wooden. For the furniture other then master bed, you can either go for typical wooden furniture or even colorful ones. You can accessorize your room with decorative pillows, vase, side lamps, small shelves and even some funky showpieces to enhance the beauty of your room. The main thing to keep in mind is that color of your bedroom shall compliment both your personality and the furniture & other accessories kept in the room. A few bedroom samples from pastel to solid, light to dark and simple to creative are here below for your reference. Because, its all about the right balance and harmony. Creativity is great but play it the way you don't spoil it. After all it gonna represent you, your identity and personality. Hope I was of some help and you enjoyed reading it!! Have a colorful day ahead. P.S. This post is a part of the Fab Blogger contest by FabFurnish.com, India's largest online home store. Get the best deals for bedroom furniture, wall clocks and bed sheets online. Very aptly written and I think, furnishings also play an important role in determining the perfect color scheme for your house. I, Stuti Shrimali, am the sole author and own the copyright for all the contents posted in this Blog. Do what you want, not what you can. Picture Window theme. Theme images by loops7. Powered by Blogger.